Are You Rich and Don't Even Know It? What does it mean to be "rich?” Does it mean an ability to afford basic needs like a home, clothing and food? Is it an arbitrary earning rate, like $100,000 per year or $1 million per year? Is richness measured by how much money you have in the bank? While there may not be a clear answer to what makes someone rich, many people do try to categorize us by earnings, assets and other measures. One common way to look at your wealth is to compare yourself to others. That often comes in the form of “keeping up with the Joneses,” or feeling bad if you can’t. Some recent studies showed the average income in some of America’s biggest cities, and where the top and bottom incomes are found in the United States. Let’s dive in to see how you compare and the answer to the pressing question: are you rich? Depending on where you live, the mid-level income varies widely. The highest average income in the country is Silicon Valley, with a top 50 percent threshold of $110,000 per year. That’s right! You need to make six figures just to reach the median income in The Valley. Nearby San Francisco has the next highest average income at $96,700 per year, according to Census Bureau data. But if you can live anywhere on your income and want to feel rich, consider a move to America’s Southeast. In New Orleans, you only need to make $48,800 per year to join the top half of incomes. Nearby Memphis is another city where you can be in the top 50 percent below $50,000 year, with a $49,800 income putting you square in the middle. Those are the extremes of metro areas in the United States for 2016. 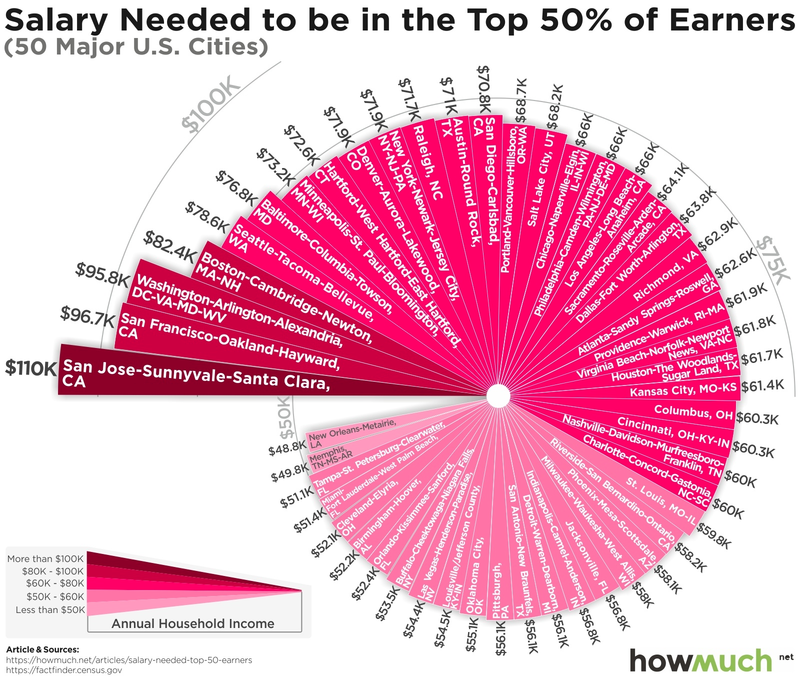 The infographic compiled by how much shows that the vast majority of cities require an income in the $60,000 to $80,000 range to reach the top half of incomes. This income breakdown also helps to show why some cities are more attractive than others. Why would someone move to Washington D.C. where you have to earn over $95,000 per year to join the top half when you could move to Atlanta, not far away and a lot more affordable? In Atlanta, $62,600 per year puts you in the upper 50 percent of incomes. Compare your total income to the chart above to see if you land in the top half of income earners in your city, or if you need to hustle to earn a little more to join the top half. Can moving make you rich? Here’s an interesting question to ask yourself. If you are not self-employed, could you move to a new city in search of wealth? If you make the average income in a low paying city, would moving to a higher average income city lead to a raise? The answer is maybe. In my own experience, I was able to move to a new city and get a 40 percent raise in the process. Much of that, however, was due to a new MBA, working with a high-quality recruiter, and changing from a low paying industry to a highly profitable one. But in some cases, if you have the right skills you can absolutely do the same. Just keep in mind that you may be able to get a raise in your current hometown before you uproot and move to a high-income city that may also cost a lot more in comparison to where you live today. Nearly a decade ago, I had a lively debate with another personal finance blogger about what makes someone rich, or at least upper class. He argued that a $100,000 income in San Francisco does not mean it is easy to get by. That may be true, but it could just be a matter of how you are trying to get by. Perhaps you have let lifestyle inflation take you into a more expensive living situation than you can really afford, but that does not make you poor. Maybe you are rich. Compare your standard of living to that in other parts of your city, other parts of the country, and other parts of the world. If you have a high income and still struggle with the bills, stop looking at your neighbors and start looking at your budget. If you manage your money right, you may be able to live a rich lifestyle on what you make today. If you can find happiness living within your means, you are on the right track for a lifetime of happiness and success. Will Getting Rich Make You a Jerk?